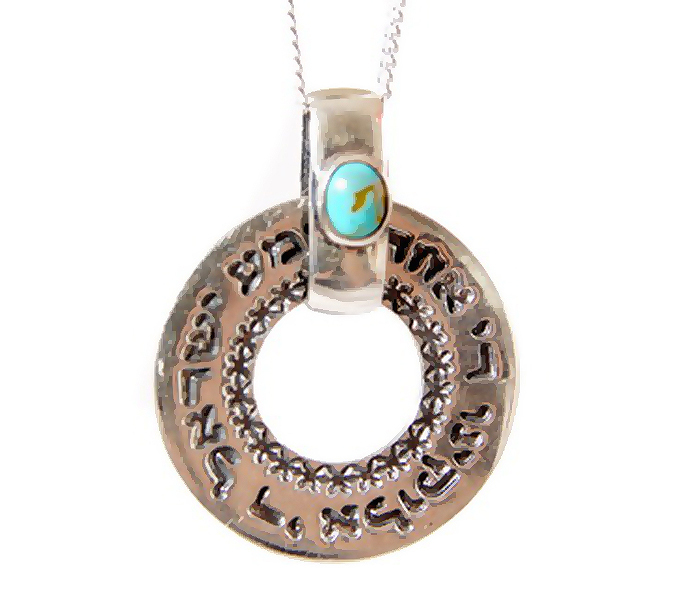 A small turquoise adorns the top of this flat ring pendant in stering silver from Emunah Jewelry. A Hebrew blessing is engraved on the pendant's surface. Engraved on this polished silver ring pendant is either the priestly blessing Yivarechecha Hashem V'Yishmarecha [G-d will bless you and keep you] or Ben Porat Moshe [a sephardi phrase to ward off the evil eye]. A natural turquoise stone is a lovely accent to the pendant's clasp. All of Emunah's jewelry uses the best materials available- 925 sterling silver, 9/14/18 karat gold, pewter, and precious and semiprecious stones. Each piece is stamped with the company's ID to ensure quality and prevent imitations. All Emunah jewelry comes with a warrantee.